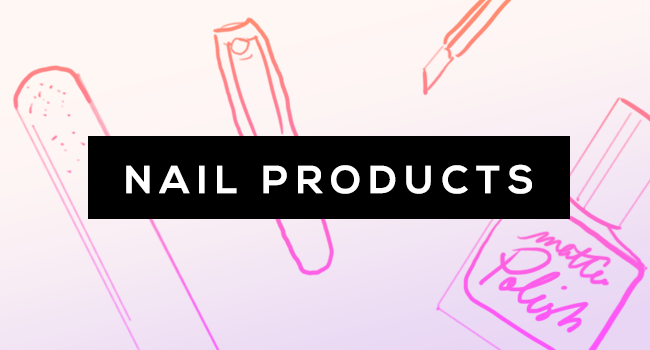 As self-proclaimed beauty product junkies, we know a thing or two about the latest and greatest items to hit the beauty department. We test, we experiment, and we play around with some of the coolest breakthroughs in the business, and it’s only right that we share this knowledge with the world. Whether you’ve been hearing about konjac sponges and can’t wait to figure out what they actually do, or you’re simply curious about the real difference between all of those makeup brushes you have in a drawer, you’ve come to the right place. 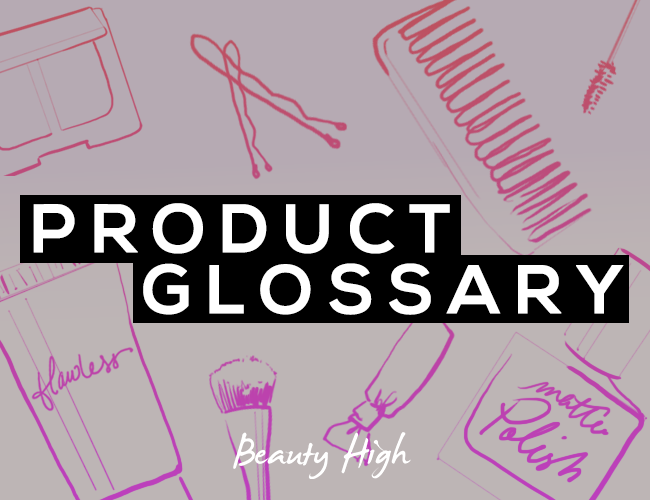 Below is a beauty product glossary that will become your best friend while shopping the beauty aisle. 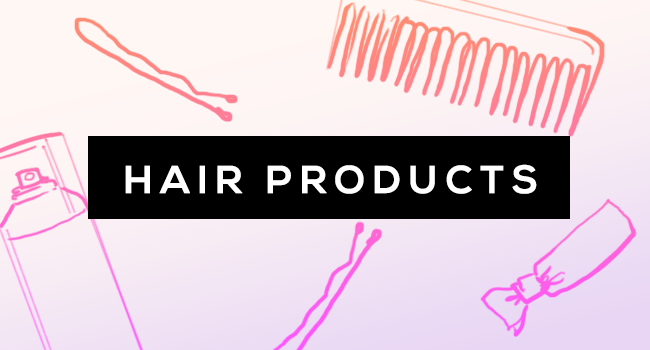 With everything from finishing sprays to exfoliating powders, read on for some serious product education. Airbrush Foundation: Traditionally used by professional makeup artists, airbrush foundation has made its way to the at-home market in recent years. Packaged either in an aerosol spray can or as a liquid that you can attach to a misting machine, airbrush foundation allows you to apply foundation as an ultra fine mist, which translates to a smooth, beautiful finish. Angled Eyeshadow Brush: An eyeshadow brush that’s short, fluffy, and angled, this option works as an all-in-one when applying shadow. Turn the brush on its side for crease application, use it flat for a wash application, and tilt it on its angle for shadow on the inner corner. BB Cream: A lightweight alternative to foundation, BB cream gives five main results, including hydrating, priming, concealing, treating, and protecting skin. Many BB Creams also include SPF. Blending Sponge: An upgrade from the drugstore makeup sponges from the past, blending sponges are typically rounded, egg-shaped sponges with one tapered end and one broader end. Use the tapered end on more detailed areas of your face, then use the wider end for larger areas like your cheeks and forehead. For best results, dampen the sponge before applying makeup. Brow Pencil: Whether you’re in the midst of growing out your eyebrows or you’re simply going for a bolder look, a brow pencil is one of the easiest ways to enhance your eyebrows. Similar to an eyeliner pencil, brow pencils come in traditional and twist-up pencil form, and are used to shade your eyebrows. Choose a shade about one hue lighter than your natural brow color, and once you’re done using the pencil, comb through with a spoolie brush for a more natural finish. CC Cream: Similar to a the lightweight coverage of BB cream but one step further, CC cream works to color correct uneven skin tone, discoloration, or dark spots. Many CC creams are also targeted towards anti-aging needs, working to smooth the appearance of fine lines and wrinkles plus they also include SPF. Concealer: Used to cover under eye circles, uneven skin tone, and blemishes, concealer works to hide any problem area on your skin. For blemishes that are particularly red, use a green tinted concealer as it will neutralize the red. When concealing dark circles, choose a pink or orange toned concealer as it will neutralize the dark blue or purple tones under your eyes. Concealer Brush: A round-topped, short-haired, sturdy brush that allows you to apply and blend concealer, grab a concealer brush for smooth, even application every time. Contouring Cream: When contouring your face to give the appearance of stronger bone structure and definition, a contouring cream comes in handy. Formulated as a cream for a smooth finish, contouring cream looks similar to a concealer, but is meant to be darker than your skin. Choose a shade about one to two shades darker than your natural skin tone, and apply with a damp makeup sponge to your jawline, temples, underneath your cheekbones, and the sides of your nose. Blend, blend, blend for a natural look. Cream Blush: Typically in a small pot or a tube, cream blush comes in a variety of shades to give you a flush of color. Use your fingers to apply a small amount of the cream to the apples of your cheeks. Because of the formula, cream blush typically lasts longer on your skin than a powder blush. Eye Crayon: A simple application for eyeshadow, an eye crayon is essentially a cream or gel eyeshadow formula packaged into a twist-up crayon. They’re particularly helpful when you’re going for an intricate or more dramatic eyeshadow look (such as a smokey eye) and you need precision with application. Eyebrow Gel: Similar to the packaging of mascara, eyebrow gel comes in a tube with a spoolie wand brush. Colored eyebrow gel is used by ladies who want to fill in their eyebrows but don’t want to worry about the precision of a pencil. Alternatively, clear eyebrow gel is used to keep unruly eyebrows in place all day long. Eyelash Primer: Eyelash primer is a clear or white mascara-like product that’s applied to eyelashes before mascara to enhance the thickness and length of eyelashes. Sometimes, mascara tubes are dual-ended, including an eyelash primer on one end and a mascara on the other to be used together. Eyeliner Brush: A flat, skinny, angled brush with short bristles, eyeliner brushes are the ultimate tool to create a defined line (especially for a cat eye!) with gel, powder, or cream eyeshadow or liner. Using the eyeliner brush wet will give you an even bolder finished product. Eyeliner Gel: Eyeliner comes in various forms, but for a graphic, striking look, go for a gel liner. Gel liners come in small pots and are meant to be used with eyeliner brushes, giving you incredible precision and a smooth, gliding application. We recommend going for a waterproof gel eyeliner for optimal results. 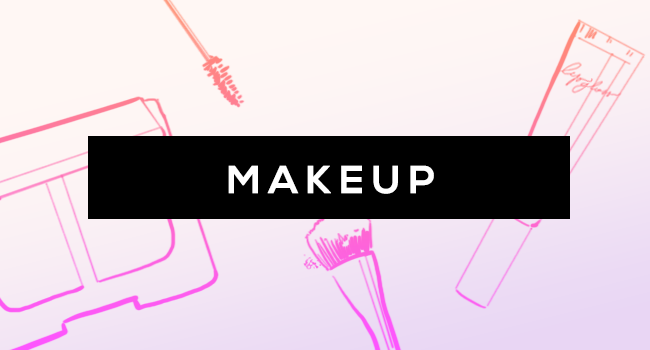 Eyeshadow Primer: If you’ve got oily eyelids or a long night of makeup ahead of you, you must start your look with eyeshadow primer. Found in both cream and gel formulas, eyeshadow primer is applied directly to the eyelid and works to keep shadow in place by absorbing any kind of oil on your lids. Eyeshadow will adhere to the primer instead of your lid, which gives you serious staying power. Face Primer: Meant to be worn underneath a full coverage foundation, face primer is applied to clean, dry skin before any makeup to help keep cosmetics in place. Primer smooths out skin and keeps oil at bay to help your makeup stay fresh all day long. Finishing Spray: Also known as setting spray, finishing spray is a mist that’s applied to your face once you’ve finished your makeup to help hold it in place. Finishing spray is particularly important on hot, humid days when your makeup can start to melt or wipe off during the day. Foundation Brush: Meant to be used with a liquid formula, foundation brushes are flat with a wide, round top, and work to give a streak-free finish with foundation. Heated Eyelash Curler: In the same way that a hot curling iron can give your hair a lasting curled texture, heating your eyelash curler will set your lashes up for a gorgeous wide-eyed look all day long. Typically a small, battery-operated device with a small wand, let a heated eyelash curler heat up for about 15-20 seconds, then gently hold it at the root of your lashes to curl them. Highlighter: Also known as luminizer, highlighter is a light, often pearlized product that is available in liquid, powder, and stick forms. It’s meant to be used to highlight the places on your face where light usually hits (apples of the cheeks, bridge of the nose, cupid’s bow, inner corner of eyes) to brighten up your look. Highlighter can be used alone or in tandem with a contouring cream. Kabuki Brush: Grab a kabuki brush when you’re applying powder, bronzer, shimmer, or blush. A wide, round, fluffy brush with a large base, the kabuki brush works well for large surface areas on your face and is designed to evenly distribute powder flawlessly. Lash Enhancer Serum: For ladies who want to grow longer lashes, consider lash enhancer serum. A clear liquid that’s formulated with ingredients that promote the growth of lashes while conditioning existing eyelashes, lash enhancer serum is meant to be applied directly to the lash line every night for optimal results. Lip Crayon: Lip products in the form of a twist-up crayon, lip crayons are typically formulated as a sheer lip balm or stain, and are more sanitary than a pot of lip balm (which you’d typically apply with a finger). Lip Plumper: Lip plumper is a clear, serum-like product with ingredients that work to enhance blood flow in the lips, delivering a tingling sensation that translates to a fuller pout. Often times, lip plumper is an added ingredient in existing lip products that offer plumping as a side benefit. Lip Primer: Designed to be worn under lipstick, lip primer works to fill in and smooth out lips for smooth, even color that lasts without feathering. Lip Stain: Lip stain is color without texture, which is perfect for girls who want saturated lip color without the feeling of lipstick. Most commonly seen in packaging similar to lip gloss, stain comes in a liquid form and dries to a sheer wash of intense color. Liquid Eyeliner: An eyeliner for the most skilled beauty junkies out there, liquid liner comes in a thin tube with a short, pointed brush for application. If you’re going for a bold liner look — winged, cat eye, or graphic — liquid is the way to go, but be sure to have Q-tips ready for clean up, and give your eye about 30 seconds of dry time once you apply. Lipstick Brush: For ultimate precision, apply your lipstick with a lipstick brush. Short, stiff, smooth bristles give you a precise application on a tough spot. Makeup Eraser Pen: Makeup eraser pens are incredibly useful when it comes to small areas (eyes and lips) that need cleaning up in the details. In the form of a marker, the tube of the makeup eraser pen is filled with makeup remover. Use the tip of the pen to remove stray marks of lipstick or mascara, plus use it to get your cat eye just right. Mineral Powder: A loose foundation powder made with minerals, mineral powder is applied with a large foundation brush. The formula allows your skin to breathe without clogging pores, and is particularly good for sensitive skin as it’s non-irritating. Solid Brush Cleanser: Solid brush cleanser comes in the form of what looks like a large pot of lip balm, and is essentially a more solid solution for cleaning your makeup brushes. To use it, dampen makeup brushes with water, then swirl the brushes around the balm cleanser for about 20-30 seconds, or until a lather forms. Then, rinse the brush and lay flat to dry. Rinse the surface of the cleanser with water to remove any bacteria, prepping it for the next cleaning. Acne Spot Treatment: Typically in a gel or cream form, acne spot treatment contains a high concentration of blemish-fighting ingredients (usually benzoyl peroxide and/or salicylic acid). Because of the high concentration, you should only apply the product on a particular problem area, not your entire face (hence the title “spot treatment”). Benzoyl Peroxide Wash: Ladies with blemish-prone skin, pay attention. Benzoyl peroxide is a key ingredient used in many acne treatments, working to keep skin clear and cleansed by fighting the bacteria that causes acne. It’s available in both face and body wash products, so depending on where you’re seeing acne on your skin, use the corresponding product. Blotting Papers: As thin as tissue paper and coated in a layer of powder or another mattifying ingredient, blotting papers work to gently remove oil, bacteria, and excess dirt from your face, especially in the T-zone. Body Milk: Similar to body lotion but in a liquid form, body milk is used to hydrate skin for overall moisturization. Usually infused with vitamins for a richer result, body milk is great for sensitive and dry skin. Body Oil: With quick absorption and a glowing result, body oil is a good hydration alternative to body lotion if you’re looking for a fast-drying formula. 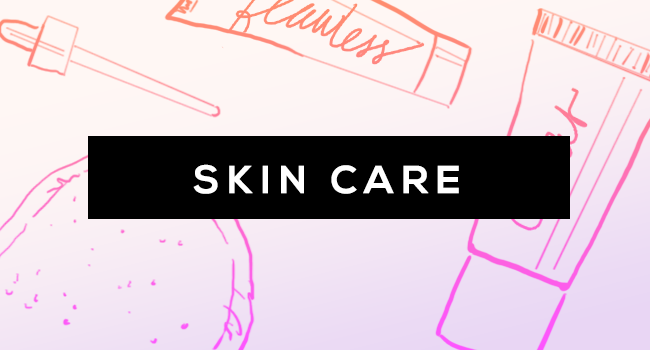 Dark Spot Corrector: Dark spots are caused by acne scars, sun damage, and genetics, but dark spot correctors work to improve these issues to even out your skin tone for a radiant complexion. Found in serum and cream form, dark spot correctors have lightening agents that work with pigmentation issues to even out skin. Exfoliating Powder: Instead of using an exfoliator with large granules or man-made microbeads, exfoliating powder is a gentle way to slough away dry, dead skin. After cleansing your face, mix the powder with water to create a thick paste. Massage the paste into your skin for about a minute, and rinse. Eye Cream: While eye creams are typically put in the anti-aging category, targeting fine lines and wrinkles, there are also eye creams designed for dark circles, puffiness, and brightening. Use your ring finger (the weakest) to tap on eye cream at night for the best results. Using eye cream in the morning can create a slippage problem for your eye makeup during the day. Face Mist: A shot of hydration to your face, face mist comes in a spray bottle and can be used over makeup or on clean skin for a quick burst of moisture throughout the day. If you have dry skin, applying face mist to refresh your look will help keep it at bay. Face Oil: Oil absorbs more quickly into the skin than a cream, which is why face oil works wonders. Most face oils are lightweight and can be used in place of a traditional lotion after cleansing. Contrary to popular belief, using face oil on acne-prone skin will not make breakouts worse. Face Peel: The at-home version of a face peel is much more watered down than the chemical peel treatment available at a dermatologist’s office. There are many different kinds of face peels for everything from acne-prone skin to uneven skin tone, and the formula works to exfoliate the top layer of skin while making the cell regrowth occur faster. Essentially, it means you’ll see a new, fresh layer of skin faster. Konjac Sponge: In place of your hands or a washcloth, a konjac sponge (from Japan) is a small exfoliator sponge used to cleanse your face. It can be used with only water, or you can add a cleanser with the sponge for extra benefits. Lip Scrub: Exfoliate your lips with a lip scrub! Usually formulated with sugar or another large granule for exfoliation, use your finger or a toothbrush to apply lip scrub to your mouth, making small circular motions to buff away dry, dead skin. Wash off the scrub and finish with a lip balm to lock in moisture. Toner: Used to remove traces of makeup and cleanser before applying lotion, toner is a clear liquid that’s typically applied all over the face with a cotton ball or tissue. It can also be used to balance oily skin. Buffer: A tool to make the surface of nails smooth and even, use a nail buffer to get a base for the best manicure possible. Some buffers also give maximum shine, but this step is best used when you’re planning on not using polish over your nails. Cuticle Oil: Usually found in a nail polish-like bottle, cuticle oil helps soften and moisturize cuticles for a smooth, hydrated manicure. Use the oil at the base of the nail and all the way up on each side of the nail for best results. Dotting Tool: Used in nail art, a dotting tool is a skinny metal tool with a small metal ball at the end. To create dots on your nails, dip the metal ball into a drop of nail polish, then place the dotting tool on your nail. Keratin Nail Treatment: Keratin is a protein naturally found in hair, skin, and nails that helps with health and strength. Keratin nail treatments are available in polish form. Simply swipe the treatment onto a clean nail and reapply every 3 days or so to strengthen nails. Nail Strengthener Treatment: Also called a nail hardener treatment, nail strengthener is applied as a polish and contains ingredients like gelatin that work to condition and strengthen nails for better health and growth. Nail Wraps: Nail wraps are full nail-sized stickers, both with and without patterns, that are applied to the nail and then filed to the proper fit of the nail shape. Many nail wraps can be removed with a regular nail polish remover. Polish Corrector Pen: A marker filled with nail polish remover, use a polish corrector pen on the edges and cuticles after a manicure to clean up stray polish marks. Ridge Filler: Used in place of a base coat, ridge filler contains ingredients such as silk that help to fill in nail ridges to give a smooth, even manicure. Striping Brush: A thin, long brush used to create intricate nail art, striping brushes are sold both on their own and in their own bottles of polish. Solo brushes can be used with any polish color. Anti-Frizz Cream: Particularly formulated for coarse, curly, or naturally frizzy hair, anti-frizz cream can be applied in small amounts to damp hair to protect from frizz during the day for a smooth look. Blow Dry Spray: Apply blow dry spray to towel dried hair for heat protection and faster dry time with your hair dryer. Available in a spray bottle, most blow dry sprays also help your style to last longer. Curling Wand: A tapered, clip-less wand used for curling hair, curling wands allow for any kind of curls from tight ringlets to loose, beach waves depending on how you place hair around the barrel. Wands typically also come with a glove for your curling hand to prevent any burns that may happen. Dry Shampoo: Dry shampoo is an aerosol spray that works to absorb excess oil in hair while giving it body and a bit of texture. Spray dry shampoo a few inches away from the roots, underneath the top layer of hair, then gently comb through with fingers to distribute the product. Hair Chalk: Colorful chalk formulated to show up on hair, use hair chalk on your strands for a temporary colorful look. To seal in the color, apply heat with a flat iron or curling iron once you apply the chalk. Hair Mascara: Historically used to cover up roots, hair mascara has evolved into a way to get colorful hair temporarily. In the form of a regular mascara but with staying power of two days time and a hair-safe formula, it’s a wonderful option for experimentation. Hair Oil: An oil that’s specifically targeted towards giving you smooth, shiny hair, you’ll only need a dime-sized amount on the mid-lengths through the ends of your hair for amazing results. If you have incredibly fine, thin, or blonde hair, you’ll need even less oil. Hair Primer: Hair primer is a lightweight cream product that’s applied to damp hair and helps to smooth your hair’s cuticle and protect strands to make your style last longer. From curls to a blowout to flat ironed hair, primer will help to make your style stay. Moisture Mask: Designed to work on damp hair, hair masks have a slew of hydrating, nourishing ingredients your hair can absorb for maximum moisture. They can be applied to damp hair and rinsed 10-15 minutes later. For an added boost, apply to damp hair, cover with a shower cap, and use your hair dryer on medium heat for about five minutes. Scalp Sunscreen: Your scalp needs sunscreen just as much as the rest of your skin. Scalp sunscreen comes in a spray bottle, and can be used on wet or dry hair. Keep it in your beach bag for reapplication, and remember to apply a bit more generously along your part. Sea Salt Spray: A liquid infused with salt, spritz sea salt spray throughout towel dried hair and let air dry for natural, beachy waves. For an extra boost, braid hair and leave it overnight to wake up with waves in the morning. Styling Wax: Soft hold wax that’s ideal for short hairstyles, use wax to get a pieced, texturized look easily. All you’ll need is a small amount (less than dime-sized). Rub the wax into your hands to disperse it a bit, then use your fingers to style certain pieces of hair for your desired look. Thermal Protectant: Typically a liquid in a spray bottle, thermal protectant is used to protect your hair from the high temperatures of heat styling tools that can do massive damage causing dryness and breakage. Apply to damp hair and comb through for even coverage.